Boston Properties, TMG Partners and Valley Oak Partners have teamed up to acquire and develop Platform 16, an urban campus near Diridon Station in downtown San Jose. Platform 16 is a 1.1 msf Class A office development located on a 5.4-acre site that is adjacent to Google’s planned 8 msf transit village and Diridon Station, the largest multi-modal transportation hub in the Bay Area consisting of Caltrain, VTA light-rail, the ACE train, and the planned BART and high-speed rail lines. The planned three-building campus, designed by world-renowned architect Kohn Pedersen Fox Associates, will feature large floorplates ranging from 25k sf to 90k sf, 15-foot floor-to-floor heights, 16 large outdoor terraces and multiple indoor and outdoor workspaces as well as on-site amenities including a large fitness and wellness facility and conference center. The project will have immediate access to the adjacent Guadalupe River Park and various retail and restaurant amenities. 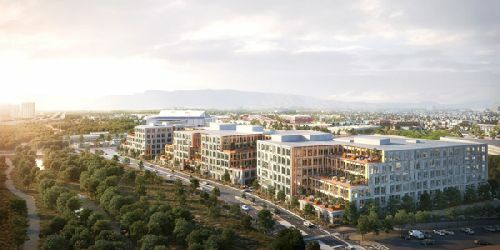 According to San Jose Mayor Sam Liccardo, the planned development will help bring thousands of jobs into the city center, with easy access to public transit, and include a number of public space improvements that will help connect the Guadalupe River Park to Platform 16 and the rest of the Diridon Station area. Demolition and site improvements are expected to start in the spring of 2019 allowing for a groundbreaking in mid-summer. The project could be completed as early as 2021. Boston Properties has decades of experience developing innovative office space for the Bay Area’s top technology companies. Last year, the company opened San Francisco’s new icon, Salesforce Tower, the tallest office building west of Chicago which is 100% leased. TMG Partners is one of the Bay Area’s leading developers with over 30 msf of office, residential, retail, and mixed-use projects since 1984. Boston Properties and TMG Partners previously collaborated on the 680 Folsom Street project in San Francisco. The project was recognized for its elegant and functional design and is home to the headquarters of Macy’s.com, Riverbed, and Anaplan.